Five differences between the primate hand and the human hand! Primates have ‘human-like’ short, flat fingernails! Did you know that far most primates have ‘human-like’ short, flat fingernails? Except for marmosets and tamarins, all primates have flat fingernails and toenails instead of claws. What are the major differences between the hands of primate species and the human hand? 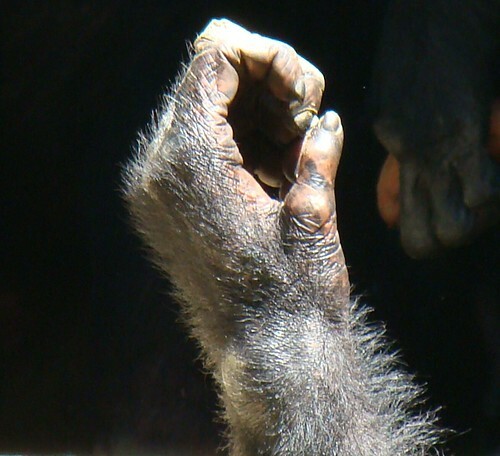 • 1 – Primates usually have a shorter thumb than humans – the thumb of the macaque (see photo on the left) does not rearch out behond the distal border of the handpalm. • 2 – Primates usually have a lower ‘2D:4D digit ratio’ than humans – the hand of the macaque is featured with a much longer ring finger (digit 4) than the pointer finger (digit 2). • 3 – Primates usually have more fingerprint- and palmar whorls than humans – the hand of the macaque is featured with 5 palmar whorls. • 4 – Primates always have a lower ‘ridge density’ than humans. • 5 – Primates usually have (various) palmar transversal hand creases, a.k.a. ‘simian lines’ – the hand of the macaque has one ‘simian line’. • PRIMATE HANDS – Finger length linked with social behavior! • Understanding our past: the human hand vs. the primate hand! • Hands in the perspective of evolution! • More interesting stories about the hands of primates! Drug addicted Amy Winehouse hurt her finger – a clear example of paronychia! “Amy Winehouse has hurt her finger. That’s the news this morning. How she did it, nobody knows, though surely it won’t be long before some news organisation suggests contacting the Portuguese police about it. All we can tell you is this: La Winehouse’s right middle finger is swollen above the top knuck and has turned the colour of a red Skittle. There also appears to be a little problem around the cuticle area, with a certain unevenness apparent in the pics posted by both Vicky Newton and 3am this morning of the singer attending a performance of the popular musical Chicago. Though the reason for the injury is unknown, speculation is rife. Vick, using her fabled gothic humour, posits: “I’ve narrowed it down to stabbing it with a hairpin putting up her beehive or burning it lighting a fag.” Others have suggested that she has, innocently, contracted some kind of fungal infection. But, whatever the cause, the big question remains: what does it all mean? And the even bigger question, too: why bother publishing the photo in the first place? In 2008, Winehouse faced a series of health complications that threatened both her career and her life. In 2009 the UK singer returned occasionally on the stage and announced working on new music projects, while her problems continued (in june her father said in an interview that she was in a drug replacement programme and in september media reported that she has started a dental dental reconstruction to improve her teeth after her battle against dring and drugs). • The paronychia nail disorder can be treated with self care at home! • Common disorders in the fingernail & toe nail! Nail pitting: the meaning & causes of fingernail pits! Nail pits are small, round depressions on the surface of the nail plate. They are usually due to disease in the proximal matrix, or sometimes, the proximal nail fold. And the arrangement of the depressions in the surface of the nail is presumably due to the extent and location of the disease in the nail matrix. Random pits in the nail can be seen as an idiopatic finding. When the pitting is uniformly distributed, giving the entire nail plate a roughned appearance, it is called trachyonychia. Treatment of nail pits should be directed to the matrix of the nail. • in children nail pitting can be a normal condition of the nail (not caused by a disease). • Common diseases in the fingernail & toe nail! • Fingernails are the barometer of your health! 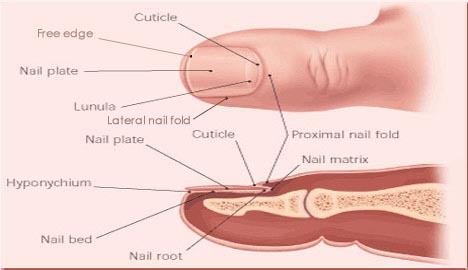 Anatomy of your fingernail: the cuticle! The function of the cuticle (or eponychium) in the nail anatomy is to function between the skin of the finger and the nail plate: the cuticle fuses these structures together and provides a waterproof barrier. Many people experience problems with their cuticles for ragged cuticles can be annoying. Whatever you do, don’t snip or bite them off – instead you better use a nail pusher or a cuticle eliminator (see the picture below). You can judge the ‘health’ of your cuticle by means of it’s: color & shape. Actually, in terms of protection of your fingernail’s health the cuticle is likely the most important part of your nail! Do you have problems with your cuticles? The cuticle: find the cause of your nail disorder! The anatomy of your fingernail: the nail unit! The basic function of your fingernails could be described as a combination of: (1) to assist in picking up objects; (2) to protect the tip of your finger; (3) to improve fine-touch sensation; (4) and to enhance the esthetic appearance of the hand! The fingernail is a unique structure whose component parts are collectively called the ‘nail unit’ (see the picture above).